Sadly, on average, a law enforcement officer is killed in the line of duty somewhere in the United States every 53 hours. Since the first known line-of-duty death in 1792, nearly 19,000 law enforcement officers have made the ultimate sacrifice. In 2009, when the Foundation was established, 122 men and women died while selflessly serving the citizens of the United States. In 2010, 152 law enforcement officers died in the line of duty. As of May 2011, 65 officers have died serving their communites. Since November 1903, Hawaii’s law enforcement community (city, county, state, military, and federal agencies) has lost 61 officers who died while protecting and serving the people of Hawaii. 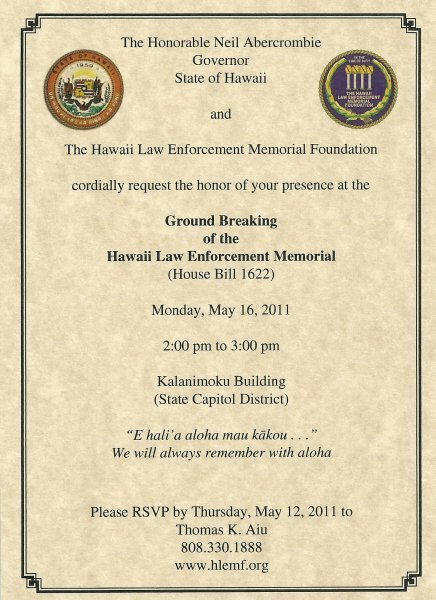 Hawaii is the only state which does not have a law enforcement Memorial. The Foundation believes that a memorial should be an integral part of the community because it pays visual tribute to her sons and daughters who made the ultimate sacrifice. It honors those who served selflessly, protecting Hawaii’s citizens, military families, and visitors. It was in November of 2009 when several pre-Foundation members took those first steps to correct this void and began to make the Memorial a reality. Since then, and due to the tireless efforts of the Board of Directors, significant legislative action has brought the Memorial concept closer to fruition. During the 25th Legislative Session (2010 term), the Foundation petitioned members of the House of Representatives for a measure supporting the Memorial. Members of the House then drafted House Concurrent Resolution 139. HCR 139 recognized the contribution and sacrifice of Hawaii’s fallen law enforcement officers. It stated in pertinent part, that the state Department of Accounting and General Services (DAGS), local, state, military, and federal agencis, SHOPO and the Concerns of Police Survivors (COPS), work with the Foundation to plan and construct a Memorial. Most significant, HCR 139 directed that land be set aside on the grounds of the State Capitol for the Memorial. On April 23, 2010, HCR 139 passed both the state House of Representatives and Senate, with not one member voting in opposition. HCR 139 directed that only private funds be used to plan and construct the Memorial, thus, fundraising would rest squarely on the shoulders of the Foundation. 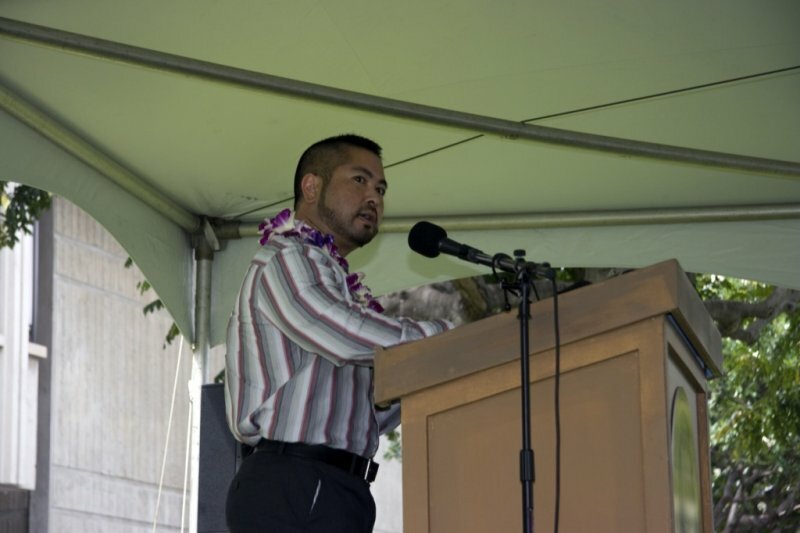 On April 25, 2011, HB 1622, after passing both the state House of Representatives and Senate, was signed into law by Governor Neil Abercrombie. HB 1622 essentially gave the Foundation and the people of Hawaii, a “deed” to capitol district land necessary to build the Hawaii Law Enforcement Memorial. 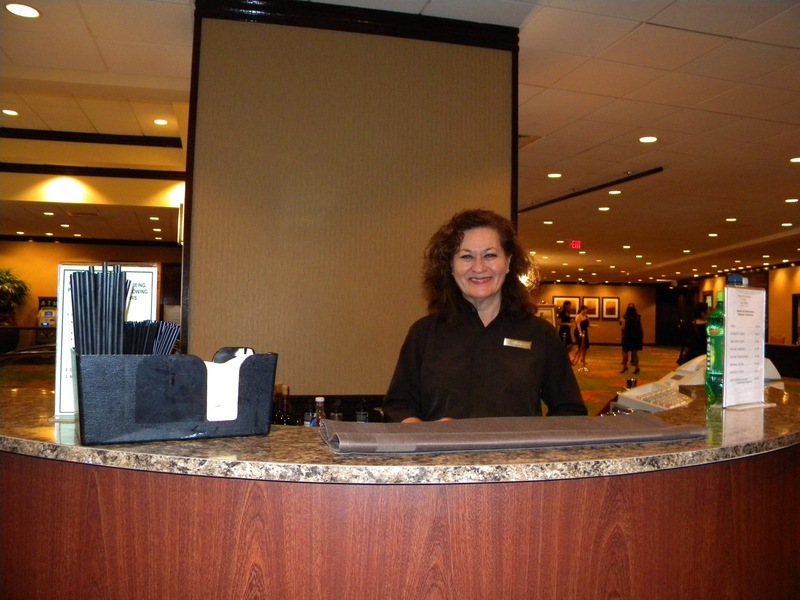 Look to this site for upcoming Foundation fundraising events which will bring the Memorial that much closer to fruition. Once completed, the Memorial will stand as a perpetual tribute to those men and women who selflessly gave their lives in the performance of their duties. It will be a place, long overdue, where police officers, deputy sheriffs, state officers, military police, federal agents, families, and the public can go for reflection, remembrance, and solitude. The Memorial will be that exceptional place for all to honor Hawaii’s heroes. A few examples of law enforcement memorials from around the country are featured below.